Zion Market Research has published a new report titled “Population Health Management Market by Component (Services and Software), by Mode of Delivery (Cloud-Based and On-Premise), by Application (Automating Patient-Centered Medical Home (PCMH), Access Comprehensive Longitudinal Patient Record, Effectively Coordinate Care, Patient Outreach, and Others), and by End-User (Healthcare Payers, Healthcare Providers, and Others): Global Perspective, Comprehensive Analysis, and Forecast, 2017—2024”. 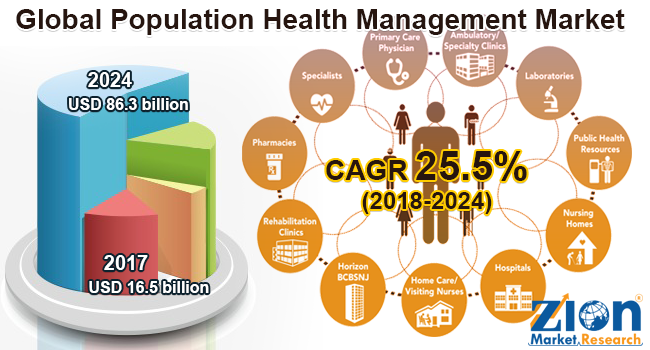 According to the report, the global population health management market was valued at approximately USD 16.5 billion in 2017 and is expected to generate around USD 86.3 billion by 2024, growing at CAGR of around 25.5% between 2018 and 2024. Population health management is the science of promoting health, prolonging life, preventing diseases by handling operational, financial, and clinical data of patients for enhancing quality and efficiency of care management. Some significant features of population health management include the access of comprehensive longitudinal patient record, integrated user experience, the transition to proactive and preventative care, effective coordinate care, identification of at-risk patients, and chronic conditions management. The demand for efficient patient care system platform is fuelling the demand for population health management market globally. The increasing prevalence of chronic diseases, the adoption of healthcare IT solutions, and the demand for healthcare integration, storage and management are estimated to drive the population health management market globally in the upcoming years. Population health management simplifies the complex task of data collection from different care settings along with data accessibility through various application program interface (APIs). This integrated information at one place allows the consumers to make informed and reliable decisions of delivering effective healthcare solutions. Moreover, population health management supports the sharing of actions and tasks to ensure full planning and allow the implementation of patient-centric care plans, and leverage the tools to provide well-coordinated care experience. Proper planning results in the identification of patients that require proactive intervention and assign the necessary tasks and actions to ensure that they receive appropriate and timely care. The key role of population health management is to provide a significant platform to deliver effective care management for intensive or long-term care by engaging with their patients, tracking patients’ progress, assigning tasks, and performing necessary risk assessments for future care planning. All these features are likely to fuel the global population health management market in the future. However, the lack of awareness and accessibility and high implementation costs might hinder this market’s future. The global population health management market is segmented based on application, mode of the delivery, component, and end-user. By component, the market is bifurcated into services and software. The service segment is sub-segmented into consulting services, post-sale and maintenance services, implementation services, and training and education services. The software segment is estimated to hold a substantial market share in the future, due to the rise in the demand for advanced software that eliminates buyers’ responsibility. By mode of delivery, this market is segmented into cloud-based and on-premises. The cloud-based segment is expected to grow significantly in the future, due to its scalability, flexibility, and affordability as compared to on-premises delivery mode. By application, the market is divided into automating patient-centered medical home (PCMH), access comprehensive longitudinal patient record, effectively coordinate care, patient outreach, and others. Increasing consumer inclination toward personalized healthcare solutions and the rising demand for significant coordinate care are estimated to drive the demand for the aforementioned applications. By end-user, the population health management market is segregated into providers, payers, and others. Providers are further segmented into ambulatory care centers, hospitals, physician groups, and integrated delivery networks, diagnostic and imaging centers, home healthcare agencies, nursing homes, and assisted living facilities, and others. Payers include private and public payers. Healthcare providers are estimated to hold the largest market share in the future, owing to the various benefits of population health management, such as reduction of per capita cost and less number of cost care management gaps. By region, North America is anticipated to dominate the population health management market globally over the forecast time period. This can be attributed to the growing influence of cryptocurrency, decline in the ownership cost, and simplified and transparent business processes. Europe is likely to be the second largest market, due to the growing demand for healthcare data provenance. The Asia Pacific is anticipated to register the fastest rate of growth over the forecast time period, whereas the Latin American market is estimated to grow moderately in the future. The Middle Eastern and African region is likely to hold a prominent market value share in the population health management market globally. Some key players of the population health management market include IBM Corporation, Verisk Health Inc., Healthagen, LLC, Cerner Corporation, i2i Systems, Inc., Health Catalyst LLC, Conifer Health Solutions, Cerner Corporation, OptumHealth, Inc., WellCentive, Inc., and Allscripts, Inc., among others.